The Flu Nearly Killed Him. 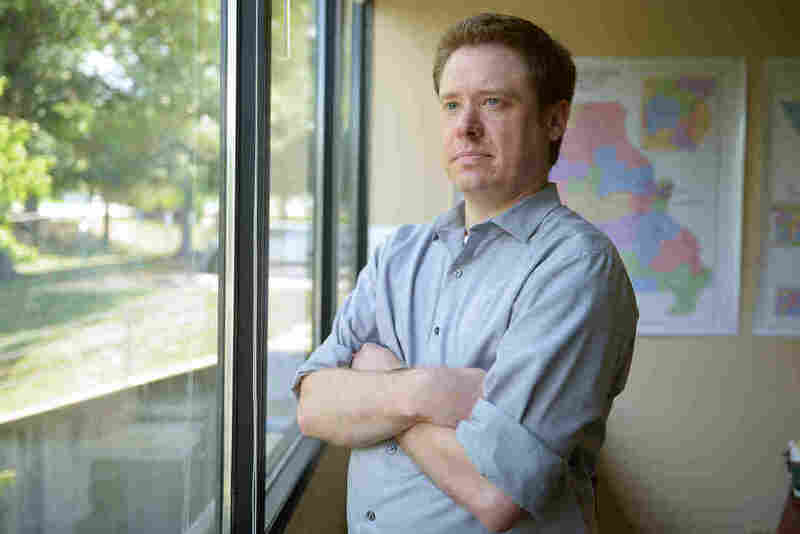 Now He Says 'Get The Vaccine' : Shots - Health News When 39-year-old Charlie Hinderliter got the flu last winter, he ended up in a medically induced coma and spent 58 days hospitalized. Serious, even fatal, complications can hit patients of any age. Charlie Hinderliter got a bad case of the flu back in January. He spent 58 days in the hospital, underwent two surgeries and was in a medically induced coma for a week. Charlie Hinderliter wasn't opposed to the flu shot. He didn't have a problem with vaccinations. He was one of about 53 percent of Americans who just don't get one. "I figured [the flu] was something that's dangerous to the elderly and the young, not somebody who is healthy and in their 30s," says Hinderliter, who is 39 and the director of government affairs at the St. Louis Realtors association. "Turns out, I was wrong," he says. An estimated 80,000 Americans died of the flu, or flu-related complications, last winter, according to initial estimates from CDC presented in September. It was the highest number of flu related deaths in decades, and Hinderliter was nearly among them. Now, after 58 days in the hospital, a week in a medically induced coma, two surgeries and three weeks in a nursing home, he's speaking out to encourage everyone to do something he'd never done before: Get a flu shot. Hinderliter came down with the flu back in January. His wife got it too, but for Hinderliter there were other signs of trouble. He had a high fever, his heart rate was up and most concerning, his blood pressure had plummeted. Nurse practitioner Megan Fjellanger realized there was something really wrong. "You looked terrible," Fjellanger told him. "We were really worried about you." Fjellanger recommended he go to the emergency room. By the time he got there, his organs were failing. His flu had led to pneumonia and then to sepsis, a life-threatening complication from infections that can cause organs to fail. Hinderliter was put into a medically induced coma for over a week. His father and brother flew in from out of town and were told they may need to say goodbye. Many flu-related deaths are caused not by the flu itself but by secondary infections and complications, including pneumonia and inflammation of the heart, brain or muscle tissues. And the flu can increase the risk of having a heart attack, according to a study published earlier this year. It's hard to say why the flu hit Hinderliter so hard. His primary care doctor, Kevin King at Mercy Clinic in St. Louis County, says there are several factors that can predispose people to complications from the flu including a weakened immune system and age. About 70 percent of hospitalizations and 90 percent of flu-related deaths occurred in people over 65 in the 2017-2018 flu season, according to the CDC. Hinderliter was an otherwise healthy 38-year-old. But King says there's still a risk for people like him. "It doesn't matter how healthy you are going in," King says. King says the flu shot is important even at times, like last winter, when the season's flu shot was not particularly effective. Last year, the most prominent virus was the nasty H3N2 influenza strain, which is why it was so deadly. The flu vaccine doesn't offer complete protection; the CDC estimates that flu vaccination reduces the risk of the virus by about 40 to 60 percent. But getting the shot is still important, because you'll likely get a milder case if you've been vaccinated. "It's not just for preventing the illness itself. We're trying to prevent the severity of the illness, and in the end we're just trying to prevent people from dying," King says. For Charlie Hinderliter, life did get better. He left the hospital in March and spent three weeks rehabbing in a nursing home — the same nursing home where his grandmother was being treated for advanced dementia. It was not an experience he had expected to have. "The family members that came to visit got a twofer. They got to visit me and her," jokes Hinderliter. On April 16th, two days before his 39th birthday, he got out of the nursing home and went home for the first time in three months. He started driving again in May, started working part time in June and got back to the office in August. But the experience was still gnawing at him. He lay awake at night trying to process everything he's been through this year. And he decided to share his experience on Twitter as an example of why people should get the flu shot. "If this story can be beneficial to others then I certainly want to be able to do that," he says. Slowly, life is returning to normal for Hinderliter, except for one thing. In September, for the first time he can remember, he got a flu shot. Bram Sable-Smith (@besables) is a health reporter based in Madison, Wis.